Camping, hiking, and hunting without the proper gear can be no fun at all; but doing any of those things with the best gear can make an ordinary excursion into an incredible experience. The vests at GrabAGun are like that too--while vests may not be the first go-to item on your packing list, they add warmth, protection, versatility, and maybe even style to any outdoorsy get-up. 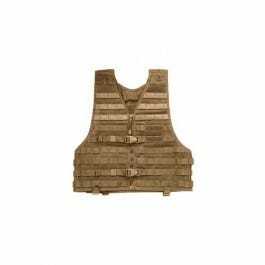 Whether you want a lightweight vest for added storage on your person or a heavy vest for additional protection against the elements for yourself and your belongings, our extensive catalog is sure to have something that suits your needs. Choose from your favorite brands like Browning, Blackhawk!, and more. We have different types of camouflage as well, so you can customize your trip in every way. A new vest just might be that overlooked item that makes your next trip into one that is unforgettable. Preparation is all in the details, whether it is the detail of where to put something, how to protect yourself, or how to stand out from the group you’re with. Maybe last time you went out, your clothes got stuck on brambles and thorns--find a canvas vest to prevent it from happening again. Or, perhaps you were just way too hot, or you had nowhere to put your duck call. Our versatile selection is made for problem-solving like that, so find what you need today. Our vests are available in multiple sizes and are easy to order right here on GrabAGun. While you’re at it, make sure you have the perfect shirt, jacket, and/or pants to go with your new vest.